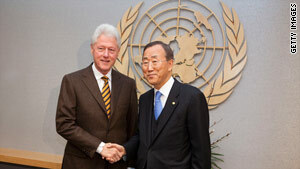 U.N. Secretary-General Ban Ki-moon asked President Clinton to oversee aid efforts and reconstruction in Haiti. Ban: "I cannot find any other better suited leader"
United Nations (CNN) -- United Nations Secretary-General Ban Ki-moon handed President Clinton additional responsibility Wednesday for earthquake-ravaged Haiti, charging him with overseeing aid efforts as well as reconstruction. A 7.0-magnitude earthquake struck the impoverished nation January 12, devastating parts of the country. More than 200,000 people died from the quake, a spokesman for the country's prime minister told CNN Wednesday. Ban asked Clinton "to assume a leadership role in coordinating international aid efforts, from emergency response to new construction of Haiti." "You have demonstrated extremely important leadership," Ban told Clinton, who is already the United Nations' special envoy to Haiti. Clinton will work with the Haitian government and the people of Haiti in recovery and reconstruction efforts, according to a statement released by Clinton's U.N. office. He will help coordinate the work of U.N. agencies and other international partners in Haiti, including government donors, private investors and non-governmental organizations, the statement said. "I cannot find any other better suited leader than yourself, Mr. President," Ban told Clinton at the United Nations on Wednesday morning. Clinton thanked Ban. "I will do the best I can," he said. "I think the challenges are great; we still have a lot of emergency problems to deal with," he said. "Almost all the infrastructure (is) gone there, so the trick is to get the Haitian people back where they can stop living from day-to-day and start living week-to-week or month-to-month." Clinton added, "The leaders there want to build a functioning modern state for the first time."